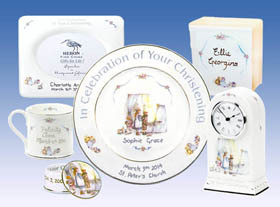 Castlemere is proud to present HERON FINE CHINA of England, creators of personalized Bone China giftware. Each keepsake is completed with care, using the traditional skills of Hand Gilding and Enamelling. As a special touch, your keepsake gift is shipped from England directly to the person to whom you are presenting the gift. A delightful surprise! A card will be sent to the recipient notifying them that a special gift from you is on its way and will arrive within 3 to 4 weeks. Each keepsake is personalized and makes a perfect commemorative birth gift or christening gift; an elegant addition to baby's room to be treasured for a lifetime. 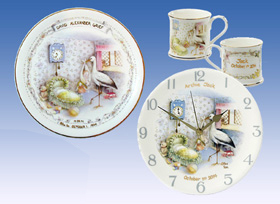 The English Nursery Stork Style was one of the earliest styles created by Heron Fine China. Click here to order. The Staffordshire Blue Style is based on the Nursery Stork Style but re-designed to give a more contempory feel. The Traditional Style was originally designed for the Heinz Baby Club. 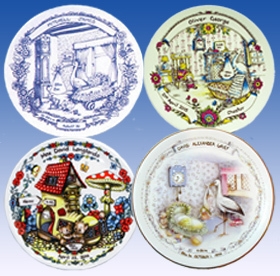 Nurseryland Style is a bright full color design exclusive to Heron Fine China. 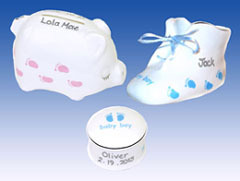 The Little Feet Style is one of the more recent birth styles available in either baby pink or baby blue. Click here to order. The Christening Collection features a design showing young children presenting gifts to the new baby. Each piece features platinum detailing by hand. 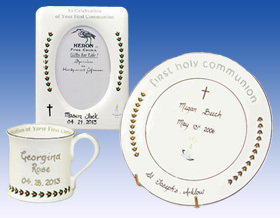 The First Communion Collection by Heron fine China features a wreath pattern. Each item is hand gilded in platinum. Click here to order. 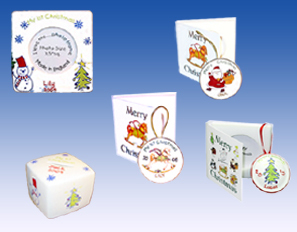 Fine English bone china items with Christmas themes are hand painted in bright primary colors. Click here to order.